When it comes to spring, I always think of a time of newness and renewal. Because we had such a rough winter this year, the idea of the warm sunshine on my face and seeing those daffodils peeking from the ground makes me very happy. Another thing about spring is you get to put away those winter clothes and bring out your warm weather wardrobe. When I am transitioning my closet from one season to the next, I usually donate or toss the pieces I do not or cannot wear any longer. I also do this for the kids and my husband’s closet. This means we all get to add a few new pieces to our closet, and that is always a good thing! I mean, who doesn’t want some new clothes to show off when the weather changes? For the guys in my life, I was so excited to learn Kmart had the new Adam Levine Denim Collection. This menswear collection launched in the Fall of 2013 and is available exclusively in 500 select Kmart locations as well as on kmart.com. You can also find the line on ShopYourWay.com, which is where I love to shop because it is easy and I earn points which can be redeemed on future purchases! 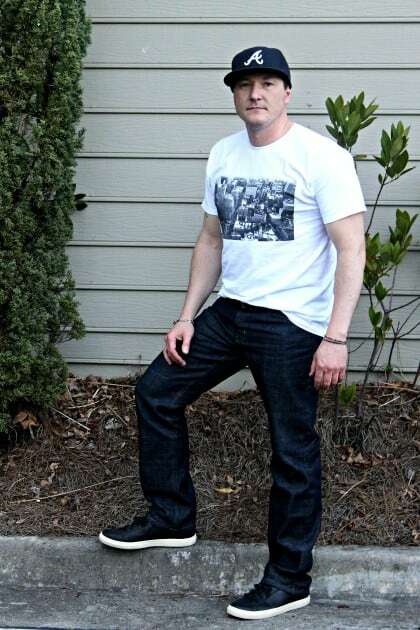 This collection has great fabrics and designs, which Adam and his partner, Project Runway designer alum Kevin Christiana, have put together for today’s young man.This premium denim line is perfect a sophisticated yet simple, casual man with an edge, which describes my son-in-law perfectly. The Adam Levine Denim Collection includes a skinny, slim leg, straight leg and boot cut fits, which all give off a cool and classic vibe for everyday wear. 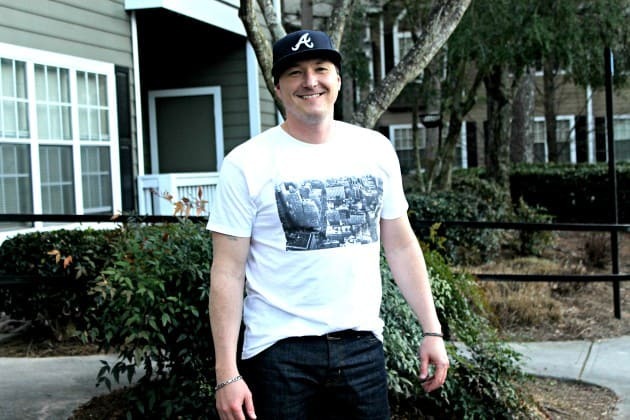 For Mike, he chose the Adam Levine Men’s Patriot Straight Leg Jeans in Raw Indigo, which retail for just $24.99 a pair. He paired these with the Adam Levine NYC Skyline Tee, which sells for $12.99, but is currently on clearance for just $7.79. To bring the whole look together, Mike chose the Adam Levine Black Lace-Up Sneaker, which were only $21.99, which surprised me because they are so well made and look fantastic! Mike was able to choose an entire outfit for well under $60, which you hardly ever find anymore, at least for such stylish clothes that look so amazing, fit so well and are made so well. The Premium Denim line features authentic vintage denim in a wide range of colors and washes (including raw with selvage trim, dark indigo rinse, bleached indigo and many more) at an accessible price point under $40. If you are looking for some great looking outerwear for those chilly spring nights, the line also consists of amazing outerwear, wovens, knits, underwear and accessories including hats, scarves, socks, belts, sunglasses, shoes and bags. With prices from $14.99-$69.99 for apparel and $9.99-$16.99 for accessories, you can fit this line into just about any budget. What piece do you like best from the Adam Levine Denim Collection? One reader will win a $50 Kmart Gift Card! This post is brought to you by our friends at Kmart through our participation in the Kmart KClub Blogger Program. I like Adam Levine Men’s Medium Wash Denim Jacket. I’d get my boyfriend Adam Levine Men’s Patriot Straight Leg Jeans! I like the Adam Levine Men’s The Patriot Straight Fit Jeans – Sustainable Wash. I love the NYC Skyline Tee! The Adam Levine NYC Skyline Tee looks real nice !! I like the Adam Levine Black Lace-Up Sneaker. Besides the whole collection, I like the Adam Levine Raw Indigo Men’s Patriot Straight Leg Jeans. I like the NYC skyline shirt. I would get the Adam Levine Nlack Lace-Up Sneakers. Adam Levine’s Skyline Tee. Very cute! I would get the Adam Levine Men’s Patriot Straight Leg Jeans – Raw Indigo! I would choose the Adam Levine Men’s Patriot Straight Leg Jeans in Raw Indigo. I like the Adam Levine NYC Skyline Tee. I like the women’s chambray jogger. I’d like The Tishomingo Bootcut Jeans. This is the link for the Adam Levine Men’s Patriot Straight Leg Jeans-Raw Indigo. This is what my grown son said, and they would be for him. I like the NYC Skyline Tee the best. The mens boot cut jeans have a nice cut to them. I love the Attention Women’s Scuba Knit Skater Dress. Just in time for spring. I’d buy the sneakers, but the jeans and tee are nice too. I would get the Patriot Straight Leg Jeans for my son! Adam Levine Premium Tishamingo Bootcut Jean. I’d like the skyline tshirt for my husband. My stepson would like the Adam Levine Black Lace-Up sneakers. I like the NYC Skyline Tee. I like the Adam Levine Men’s Patriot Straight Leg Jeans. I Would buy the patriot straight leg jeans. They look slick! Funny..I bought my fiance’ 2 pair of his jeans not even 2 weeks ago..SOLD OUT! He loves them! I LIKE THE ADAM LEVINE BLACK LACE UPSNEAKER. I like the Adam Levine Men’s Patriot Straight Leg Jeans – Raw Indigo. I would buy the Adam Levine Black Lace-Up Sneaker for my husband. I really like the women’s chambray jogger from Adam Levine found at KMart. I would choose Adam Levine Men’s Patriot Straight Leg Jeans – Raw Indigo. I like the Black Lace-Up Sneaker! I would get the Adam Levine Men’s Patriot Straight Leg Jeans – Raw Indigo. I like the denim shirt. I like the Patriot Straight Leg Jeans. My hubby would just love the patriot straight leg jeans and I think he would look great in them also. i love the Adam Levine Black Lace-Up Sneaker. I’d pick up a pair or two of http://www.kmart.com/adam-levine-men-s-patriot-straight-leg-jeans-raw/p-042VA71690612P?prdNo=2&blockNo=2&blockType=G2 since I could totally use some new jeans this year. 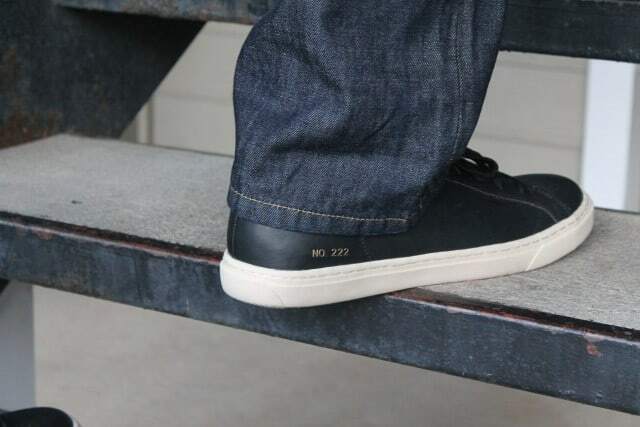 The Patriot straight leg jeans are nice. I would buy Adam Levine Men’s Patriot Straight Leg Jeans – Raw Indigo. I would get the Adam Levine Black Lace-Up Sneaker. They look so sleek and comfy. My son would love them. I would like to buy the Adam Levine Black Lace-Up Sneaker. I would buy the Adam Levine Men’s Patriot Straight Leg Jeans in color Raw Indigo! Adam Levine Men’s Patriot Straight Leg Jeans – Raw Indigo are cute. I would pick the Adam Levine Men’s Patriot Straight Leg Jeans in Raw Indigo for my husband. He loves to wear jeans. I think the Adam Levine Men’s Patriot Straight Leg Jeans in Indigo would make a nice present for my brother. I also like the shoes. Those shoe’s are the bomb! I love how Adam’s clothes look casual but also expensive! Rawr! My kind of man! I’d get the Levile black lace up sneakers. I like the Adam Levine Men’s Patriot Straight Leg Jeans – Raw Indigo. Very rock star! I would get the Adam Levine Men’s Button Down Shirt Gingham. I would buy the Adam Levine NYC Skyline Tee for my husband. I would buy the Adam Levine NYC Skyline Tee. I’d buy the Adam Levine Black Lace-Up Sneaker for my boyfriend! I think the Adam Levine Men’s Patriot Straight Leg Jeans – Raw Indigo would look nice on my husband. I would buy some of the straight leg jeans for my teen boys. They can never have too many pairs of jeans! I hope there a small mens size pants because I have a small waist. And sometimes I wear kids size jeans LOL!! I’d buy the patriot straight leg jeans in raw indigo for my son. I like the Adam Levine Men’s The Dean Slim Fit Jeans – Traveler. They are my favorite! I’d buy the Adam Levine NYC Skyline Tee. I would get Adam Levine’s Men’s Patriot Straight Leg Jean- Raw Indigo. My oldest son would like them. I have been hearing a lot about this brand lately. It sounds like they have some good quality denim. Black lace-up sneaker is cool. Would def buy hubby a pair of those straight legged jeans and kick in a little extra for a pair of those sneakers. I’d get the Adam Levine’s straight leg jeans. I like the Adam Levine Men’s The Dean Slim Fit Jeans. I would buy the Adam Levine Men’s Patriot Straight Leg Jeans for my husband. I like the Adam Levine Men’s The Dean Slim Fit Jeans – Traveler. Oh he would love the Adam Levine Men’s Patriot Straight Leg Jeans – Raw Indigo! Great price for them! I’d choose the Adam Levine Black Lace-Up Sneaker. I would get the Adam Levine black lace up sneaker! What a great clothing line, I wonder if my fiance would wear a pair of his jeans. I’d get the Patriot men’s jean from Adam Levine for my husband. I’d buy the Adam Levine Men’s Patriot Straight Leg Jeans – Raw Indigo. I like how dark these jeans are and affordable is always a big plus. I love the Adam Levine collection at Kmart. I was walking through there a few weeks ago and I was surprised to see it. I didn’t know about it before. The jeans are nice. I agree. I think of Spring as the time to clean out all of our closets and start removing all the stuff we do not need. Thanks for sharing Adam Levine’s new collection. That is awesome! I am a fan of his and his particular style so now I have a go-to place whenever I need to shop new things for the men/boys in our family! I like the “Adam Levine Men’s Carpenter Jean – Light Wash”. Buying denim can be expensive when you have four kids. This is a cute line of jeans! The sneakers and tees are definitely my favorite. Your son-in-law looks like he liked everything a lot! I’m always the one who buys the husband’s denim pants. I like the Patriot Straight Leg Jeans – Light Wash. I think he will like it too! I like the Patriot Straight Leg Jeans – Raw Indigo. I’d get the Men’s Carpenter Jeans. I love the looks of those jeans. Are those really from Adam Levine? They’re awesome. Dig the denim and his rockin’ shoes! Those are great! This looks like a great line of Jeans. I will have to show my son and see what he thinks. My father would look nice in the slim fit jeans. We like the colored straight fit jeans. The dark wash is nice. My son would like the slim fit jeans. I would choose the Adam Levine Men’s Patriot Straight Leg Jeans – Raw Indigo for hubby. I also like the Tie Dye Maxi Dress though for women. That’ s just cute! Never heard of these! Great giveaway! I would choose the Adam Levine Men’s Slim Fit Jeans – Camo. Thank you for the chance. They look comfy and would slightly dress up jeans. Jeans for my husband. He needs a nice pair. this sounds like a pretty great line!!! I will have to show hubby 🙂 Had no idea that Adam Levine started is own line! I’d get my man the Adam Levine Men’s Patriot Straight Leg Jeans. What an awesome giveaway! My hubby and my oldest son would love these Jeans. I love that outfit! My husband would look great in that. Awesome you got pics like that- no way my husband would take photographs for my blog lol! I would like to get my husband Adam Levine Men’s Dark Indigo Jeans. I like the Adam Levine Tishomingo Boot Cut Jeans. I had no idea that Adam Levine released a denim line at Kmart of all places. I have a feeling my husband will actually really like the style so I’ll have to pick him up a pair as a surprise. I like the patriot straight leg jeans . that denim does look high quality! I’m definitely going to check out what they have to offer! I like the Adam Levine Men’s Selvage Pocket Plaid Shirt. I didn’t know Adam Levine had a denim clothes line. I will have to check it out. I really like the Adam Levine Black Lace-Up Sneaker. Very nice looking. Kmart always has great clothes at great prices! I would love the Adam Levine NYC Skyline Tee for my hubby. Love the womens Adam Levine line also! The Tishomingo Bootcut Distressed Jeans are my choice – they look very comfortable and stylish! I like the Adam Levine Black Lace-Up Sneaker! I’ll get Adam Levine Men’s Patriot Straight Leg Jeans – Raw Indigo. This is an awesome giveaway indeed. I would have to say my son would love to have the black lace up sneakers and the Straight legged jeans. Thanks for sharing. Visited and I think I would pick the Adam Levine Men’s Patriot Straight Leg Jeans – Raw Indigo for my Husband. I had no idea he had a clothing line. Probably the sneakers! both hubby & my son would like the NYC skyline tee from the Adam Levine collection. I haven’t shopped at KMart in quite some time. My son would definitely love those jeans. He probably has no idea who Adam Levine is but those jeans are his style. How cool! I had no idea Adam Levine had a collection! I love the jeans. They look great! I will have to check out more! My hubby needs some new clothes- I think the New York City skyline tee from the Adam Levine men’s collection looks cool. Adam Levine Men’s Patriot Straight Leg Jeans – Raw Indigo is what I would get. These are such a great price point! The Dean Slim Fit Jean would look amazing on my hubby! I would like to get the Adam Levine Men’s Patriot Straight Leg Jeans – Raw Indigo. I’m all about jeans and tshirts on any day of the year. I love a good comfortable pair of jeans. I like the vintage look of the Dean straight cut jeans. I’m surprised how affordable they are, too. However, my husband needs a more relaxed cut jean so I don’t think Adam’s jeans would work out for him or for a lot of guys. They just don’t look roomy enough. I have not heard of Adam Levine denim before. They look comfy, I like how stylish they are! Looks like he is loving the look! My hubby would enjoy these jeans I think! I love this line, looks very nice and comfy in the photos. I love the dark demin color too, makes a more handsome look. Thanks for sharing this line, as until now, I had not heard of it! This looks like a great line! I think my almost-teen son would love to try out any of the looks – he’s a huge Adam Levine fan! I would buy for my son the Adam Levine Men’s Black Jeans – Skinny Fit, and the Adam Levine Men’s Patriot Straight Leg Jeans – Raw Indigo. Nice looking pants. When his line launched, I noticed the HUGE number 222 in the stores first. That Number follows me EVERYWHERE! It’s my lucky number! I will take one in each size….for me! They look so darn comfy! The Tishamingo boot cuts are hot. Great prices! Will have to check these out for my husband. I love his collection! I just grabbed a whole bunch of stuff for my hubby the other day! Wow, I didn’t know he was branching out into clothing. He always look great, so I’m excited to check out all that he’s offering in his collection. Those jeans look great. I have to get my son and my boyfriend a pair. They would love them. How fun! I’ve seen women celebrities with clothing lines, but fewer for men. I’d buy the Adam Levine Men’s The Patriot Straight Leg Jeans. I would get the Adam Levine Men’s The Dean Slim Fit Jeans for my husband. Those jeans look great! They look comfy. I am all about comfort st and foremost. My son really likes those dark wash jeans. I’ll have to check these out for him. I would get a hoodie or jeans. I would buy the Adam Levine Men’s Carpenter Jean – Light Wash. I didn’t know Adam Levine had a collection right now! I’ll have to look into getting my hubby some jeans! Those jeans look great!! I had no idea that Adam Levine had a line at Kmart now! I think my hubby would like the patriot straight leg light wash the best. I think the Adam Levine collection is awesome. He definitely knows what goes into a good pair of jeans. We might drop by at KMart tomorrow and check it out. My husband needs some new pairs of pants. Those jeans are so stylish! A little too stylish for my husband, but my son in law would love them. My husband could definitely use some new denim and I love the darker washes available in this line. You certainly can not beat those affordable prices as well, especially when you have to purchase clothing for the entire family! My hubby would look good in these styles. We both love Adam Levine and didn’t know that he had this line, but am now looking forward to taking my husband to try some things on. I’m excited about this line of clothes. I love the look of vintage denim and really like the Premium Denim line. Thanks for sharing. My husband would like the Adam Levine collection. They have such cool styles and you can’t beat those prices. I’d Buy The Adam Levine Premium Tishamingo Bootcut Jean. Adam Levins collection Rocks(pun intended). I really like his t-shirts. I love the ones that your husband chose. Those are really nice! I really love that Adam has his own line! Hopefully I can get my husband to wear them! I really like the style of jeans he picked. The sneakers and tee work really well with that color. I like the Adam Levine Premium Tishamingo Bootcut Jean. Those are some sharp jeans! I’ve got to get some for my husband and my son. Thanks! I am SO glad to see this collection of jeans. Maybe these will replace the unfortunate skinny jeans and those weird saggy things that I’ve been seeing so much of lately. Those jeans look great! I’ll tell you, there’s nothing better than a good pair of jeans! I will buy some for my hubby and kids just because it has Adam Levine’s name on it. Swoon.